I think one of the most fascinating areas that reflect aesthetics in everyday objects is furniture design. For a few centuries, furniture design was predicated on accommodating the human form based on social customs and costume of the time. For example, during the Queen Anne period in England (reigned 1702–1714), card playing was wildly fashionable, and chairs for card tables were often designed with a padded rail on the top of the back splat so that a special someone, leaning on the padded rail, could watch the player sitting at the table. In the 19th century, during the height of the crinoline (hoop skirt) period (1850s–1860s), side chairs were often designed with short legs and no arms to accommodate the voluminous skirt and, preserve a woman’s modesty, preventing the hoop from tipping up and revealing a (gasp) ankle. The Arts and Crafts movement (1860s–1890s), which emphasized a combination of fine art and design, signaled the beginning of the period of furniture design where the body was given less gravity in design than aesthetics. Furniture of the 1970s and 1980s became a new province of innovative artistic design, regardless of whether the resulting item was comfortable or not. What occurred was a swing of the pendulum in the opposite direction, where bold design was more important than accommodating the human body. Isn’t it ironic that what started in the Arts and Crafts movement and the Bauhaus ended up rather far from what those artists envisioned—a grafting of both the comfort of furniture and its artistic qualities? I have actually had the opportunity to sit in an example of this “Experimental Edges” piece, and found myself sliding forward, perhaps because I was so paranoid that the wonderful rhythmic support would collapse! Frank Gehry studied architecture in southern California, working at first in the office of the architecture firm Victor Gruen and Associates. 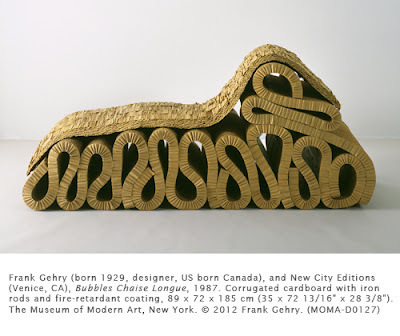 Gehry opened his own architectural firm in 1962 after a trip to France, during which he was excited by the sculpture of Constantin Brancusi (1876–1957) and architecture of Le Corbusier (1885–1954). He soon became famous for the use of daring, unexpected shapes and choices of materials for buildings. His early buildings were known for Gehry’s use of corrugated tin, wrought iron, netting, and chain link fencing—many of these were often recycled materials to make his structures environmentally responsible. He approaches each building as a sculptural object rather than being interested in appropriateness for the purpose of the building. Gehry approaches furniture with the same spirit of this philosophy. This piece, as well as others in the Easy Edges and Experimental Edges series, was an attempt to create an environmentally responsible type of furniture, cheap to reproduce and affordable for the mass market. The layers of corrugated cardboard—laminated and supplemented by metal rods—create fluid, roller coaster-like shapes.